In February 2018, the Royal Oman Police (ROP) announced a new online system for visitors to apply for their tourist visas. The new online visa system is intended to facilitate the process for tourists traveling to Oman and to reduce the wait time at the arrival terminal. The e-Visa system is an online method of applying for visas for entry from anywhere in the world. Some advantages of this system are that visas can be applied for quickly over the Internet at any time and from any location. Payment is made online at the time of the visa application. Certain nationalities require a copy of a valid visa or residence permit from one of the following countries (Schengen, United States of America, United Kingdom, Canada, Japan or Australia). These countries include: Albania, Armenia, Azerbaijan, Belarus, Bhutan, Bosnia and Herzegovina, Costa Rica, Cuba, El Salvador, Georgia, Guatemala, Honduras, India, Kazakhstan, Kyrgyzstan, Laos, Maldives, Mexico, Nicaragua, Panama, Peru, Tajikistan, Turkmenistan, Uzbekistan. The Oman e-Visa must be used to enter Oman within 6 months of approval. The Oman e-Visa is valid for 1 year. You can choose between a multiple or single entry visa. The length of stay in Oman is one month per visit. Certain nationalities require a supporting document (visa or residence permit) from the Schengen, US, UK, Canada, Japan or Australia. To view your requirements, please visit our application page and enter your nationality. The applicant must be outside the Sultanate of Oman at the time of application. This Oman e-Visa does not require a sponsor in Oman. The applicant must not have any other current Oman visa. The applicant’s passport must be valid for at least 6 months from the date they enter Oman. At entry, the applicant must have a valid hotel booking in the Sultanate of Oman, and a return ticket. If the traveler overstays in Oman, there is a fine of 26 USD for each day of overstay. 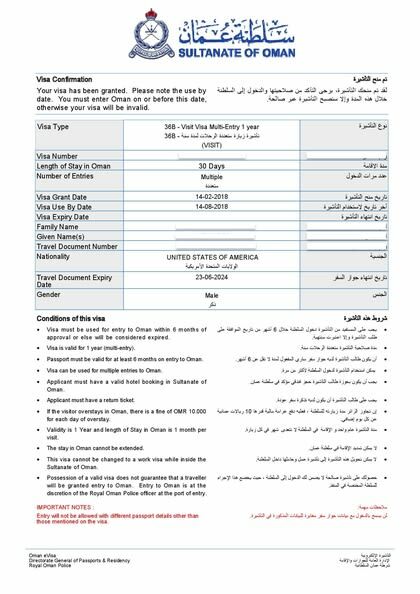 This visa cannot be changed to a work visa while inside the Sultanate of Oman. Entry to Oman is at the discretion of the Royal Oman Police officer at the port of entry. What is an Oman e-Visa? It is an official document which provides authorization to travel to and from Oman. It is electronically linked to your passport. What do I need to apply for the Oman e-Visa? Certain nationalities require a copy of valid visa or residence permit for one of the following countries (Schengen, United States of America, United Kingdom, Canada, Japan or Australia). These countries include Albania, Armenia, Azerbaijan, Belarus, Bhutan, Bosnia and Herzegovina, Costa Rica, Cuba, El Salvador, Georgia, Guatemala, Honduras, India, Kazakhstan, Kyrgyzstan, Laos, Maldives, Mexico, Nicaragua, Panama, Peru, Tajikistan, Turkmenistan, Uzbekistan. What is the cost to obtain an Oman e-Visa? The visa costs 52 USD for single entry, and 130 USD for multiple entries. Additionally, there is a service fee of 30 USD for standard processing. For rush processing and super rush processing, the service fee is 80 USD and 110 USD respectively. How long does it take to process an Oman e-Visa? Super Rush Processing: 24 hours. How long is an Oman e-Visa valid for? It depends on the type of e-Visa you selected. The e-Visa with a single entry is valid for 30 days, while the e-Visa with multiple entries is valid for 1 year. However, the multiple entry e-Visa must be used within 6 months of issuance, or it will be considered expired. What conditions must the applicant’s passport meet for the Oman e-Visa? Applicant’s passport should have at least 6-months validity from the time of entry into Oman and at least one blank page. How long can I stay in Oman with this e-Visa? The maximum stayed allowed is one month per entry. Is it mandatory to be outside Oman to apply for the e-Visa? Yes. The applicant must be outside Oman at the time of application. Can I change the Oman e-Visa to a work visa? No. This e-visa cannot be changed to a work visa. How many entries are allowed with the Oman e-Visa? It depends on the type of e-Visa you select. There is a single entry option and a multiple entry option. Do I need a sponsor to get the Oman e-Visa? No, you do not need a sponsor for an e-Visa. Who is eligible for the Oman e-Visa? Citizens of 71 countries are eligible to apply for the Oman e-Visa. You can use our visa checker tool at the top of the page to determine if your country is eligible. Why don't I see a multiple entry option when applying? Only nationals from certain countries are given the option to apply for the multiple entry e-Visa. If you are not given this option, it means you can only apply for the single entry e-Visa. How far in advance should I apply for the Oman e-Visa? You can apply through iVisa at any time. We will ensure the accuracy of your application and queue it so that it is processed within the required time frame. Once I arrive in Oman, what documents do I need to present? At entry, you must show that you have a valid hotel booking in Oman and a return ticket, in addition to the e-Visa and valid passport. If I already possess a valid Oman e-Visa, can I apply for a new one? The Oman e-Visa is valid for one year or one month (depending on your choice). The Oman e-Visa cannot be obtained using the same passport until that e-Visa expires. If you lose the passport which contains the valid Oman e-Visa you may apply for a new e-Visa by paying the relevant fee again. Is there a fine if I stay in Oman beyond the one month allowed? Yes. If a visitor overstays more than the 1 month allowed, there is a fine of 26 USD per day. Is there any restriction on the time in which the Oman e-Visa can be used? The Oman e-Visa must be used for entering Oman within 6 months of approval, or it will be considered expired. Oman is a very rich country, both in economic terms and culture. It is a country on many people’s bucket list, and that is because it has pretty much everything someone seeks in a vacation. You have adventure, sightseeing, festivals, and whatever else you can think of. If you choose Oman as your destination, you need to plan a thorough itinerary so that you get to chance to experience as much as you can in a single trip. That may not be entirely possible, but you can at least try. Until then, there are a few things that you should probably know about Oman. After all, you cannot visit a foreign country without having an idea about its gifts and cultures, can you? The first thing you need to be aware of is that Oman is a very hot country. It is very warm both in the summer and winter. Winters in Oman can have temperatures of over 15 degrees Celsius, which is still pretty warm considering the season. The weather is a bit colder in the mountains, no matter the season, but generally, you should be prepared for high temperatures. It is crucial that you always stay hydrated. The coastline is very dry as well as hot, which is why you should bring or buy a lot of moisturizers. When you go out of your hotel, make sure that you are dressed modestly. Keep in mind that the people in Oman are Muslim, and they have very strict rules when it comes to clothing. It is not expected for the tourists to dress the same way the locals do, especially if they are non-Muslim, but it would be a sign of respect to cover as much skin as possible when you go out. As a sign of respect, you should not wear bikinis at the beach either. It is insulting, and you do not want to be disrespectful, do you? However, if you want to go for a swim, you should wear a relatively long t-shirt over your bathing suit. Omanis will see it a sign of respect and they will not look at you awkwardly. As for communication, you will be able to get around Oman quite comfortably. The official language is Arabic, but the people there speak English fluently. Not all of them, of course, but enough so that you can understand each other. But then again. Oman is a melting pot of cultures. You can find Pakistanis, Hindi, and many different cultures. Chances are you will come across someone from your very own culture there. A lot of people in Oman are expats. One of the things you are going to love when you get to Oman is that you will come across frankincense everywhere you go. Even the streets smell of frankincense. Oman exports it to a lot of countries, and it is world renowned for its quality and fragrance. People burn it in every room of the house in Oman, and it is very soothing. Tourists have no cause for concern since there is not a lot of smoke from burning frankincense, but if you are allergic or can’t stand the strong scents, you should probably do something about it. Maybe take a scarf and put it on your nose and mouth when the scent is too strong. When it comes to Oman’s cuisine, you will be happy to find out that Omanis can host most culinary preferences. You can be a vegan or any other kind of a foodie. You will find something to your liking. There is nothing out of the ordinary in their diet, but Omanis know very well how to play with spices, and you will enjoy their food very much. You may want to stay away from their spicy food for a couple of days since your stomach may not be accustomed to it, but other than that, you can dig in. Drinks, however, do not contain alcohol. Oman is relatively dry when it comes to alcohol, and only international hotels sell it under s a special license. Omanis drink Kahwa, which is a particular kind of coffee that has cardamon, and red tea. They are both delicious and served with dates. You can also find fresh juices all over the place so you will not lack tasty beverages. People in Oman are exceptional. Even if they are complete strangers, they will invite you into their home. They will prepare food for you and make you feel at home. And because people are very nice in general, Oman is one of the safest countries in the world. The police are very efficient, but safety is mostly owed to the fact that the people are civilized and good-hearted. So, if someone invites you into their home, it would be impolite to refuse. You do not want to break anyone’s heart. You should know that Oman is a country for everyone. If you are an adventurer, you can climb mountains, go hiking or camping, and you can dive or snorkel. Your itinerary will be full. Plus, you can explore the sand dunes. Oman has mountains, beaches, wadis (water pools created by rainwater,) oasis, and seas. You will definitely not get bored, and chances are that you will not get to do everything you would like on a single trip. But that is okay. The Omanis will wait for you to come once again. Oman may be an Arabic country, and people may have a lot of misconceptions about Arabic nations. Nevertheless, Oman is a region worth visiting. There are very few places in the world that are as safe as Oman. Plus, you get to experience all kinds of adventures, witness festivals, enjoy good food, and what is most important, the people are incredibly welcoming. You will not feel as if you are among strangers. Kind-hearted people have this effect on tourists. As long as you respect them and their traditions, they will treat you as one of their own. Can I get a visa on arrival in Muscat? What are the Oman visa requirements? Where can I find the best Oman visit visa agents? Can I request an Oman visa verification? Do I have to print the Oman visa? Do I need a medical test to apply for an Oman visa? Is the Oman visa for Indian citizens available in Muscat? Can I get an Oman visa from Dubai? Can I obtain an Oman visa once I arrive in Muscat?